This classification scheme is agnostic to driving environments. An autonomous vehicle system can be D2, D3, or D4 on the highway, but D1 everywhere else. A system can be D4 in a geofenced area. A higher number isn’t necessarily better or more autonomous. A D4 farming vehicle on remote dirt roads probably needs less advanced technological capabilities than a D3 vehicle in a city’s downtown. A fifth category is D4R: Driving 4 (Remote). This refers to when an otherwise D4 system is monitored by a remote human operator, or when a remote human operator is available to help upon request. This classification scheme is intended to supplement others like the SAE Levels of Driving Automation, not replace them. D2: Navigate on Autopilot (with lane change confirmations). D3: Navigate on Autopilot (with unconfirmed lane changes); a feature complete version of Tesla’s Full Self-Driving Capability product. This is similar to the German system. I think it’s way better than the SAE system which is IMO absurd. You could have a vehicle without a steering wheel that spends its entire service life in autonomous mode driving around a metro area. But if it didn’t also work 1,000 miles away on a mountain road it’s not “Fully Autonomous”. The L4\L5 distinction was always murky because what a human is capable is also murky and “safe” operating conditions is pretty subjective. My grandpa doesn’t believe he can safely drive in the city and he’s a human being so is he the benchmark or is a professional rally driver who can handle back mountain snowy roads at high speed? 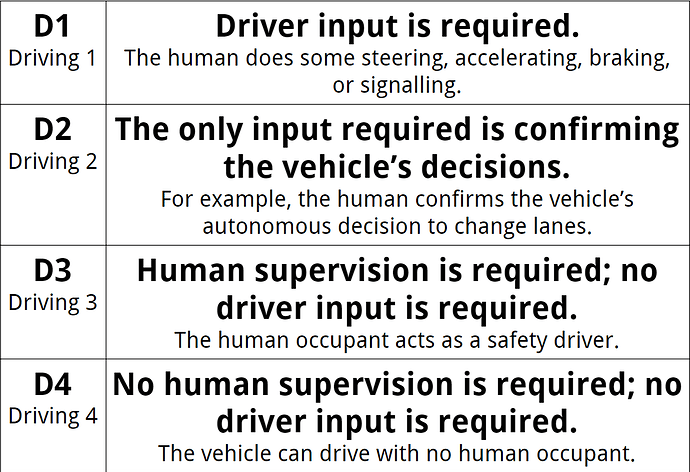 The systems should be rated on the most concrete, binary\yes\no, empirical stats possible like “requires a safety driver” which is itself subjective but much less so than the SAE stats. Then once you’ve established “Requires a safety driver” then you can get into the really subjective extents of its capabilities. “Does it work in Snow? Rain? Ice? 2” of snow? 6" of snow? How heavy of rain? How dense of traffic? Does it work at night? Is it geofenced? How large is the geofence? Can it operate on public roads? Can it operate on a highway? Can it park? etc. Then you get into competitive feature comparisons. But if it’s a people mover around a college campus then who cares if it can’t drive on public roads, it’s fully autonomous within a useful domain. What is the German system? I’ve never heard of it! BASt and NHTSA have both proposed similar levels which exclude the (stupid) SAE level 5. I think NHTSA has now adopted the SAE Levels.